Hello Dealsnloot Readers,Happy Holo....On the occasion of Holi we are going to presenting biggest loot offer. Here is an awesome loot coupon by which you will get 100% cashback on your recharge. 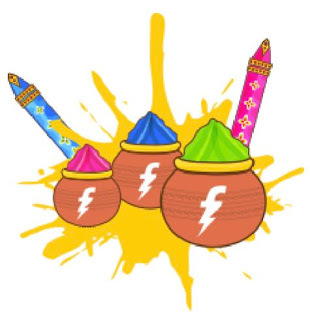 This Holi Freecharge is offering Rs.50 cashback on recharge of Rs.50. Here comes The Freecharge Holi Loot Offer, Freecharge is Giving Upto 200% Cashback on recharges Today In The Minimum Recharge of 50.Yes! you will get full cashback on your recharge from Freecharge cashback coupon. Means you will get your recharge for free of cost by this Freecharge holi coupon. This offer is only valid for new users. So if you don't have an account on Freecharge or if you never recharges anything from your Freecharge account, then it is right time to grab out free recharge from freecharge. So Grab This Loot Offer. Update - You Can Use Freecharge Credit For Recharge With This "HOLI" Code Loot offer. 6. You Will Get Cashback in Your Freecharge wallet in 24 Hours. 7. You can Use This same Offer 3 Times. Valid on min. transaction of Rs.50. Minimum cashback of Rs.3 & Maximum cashback of Rs.100 per transaction.